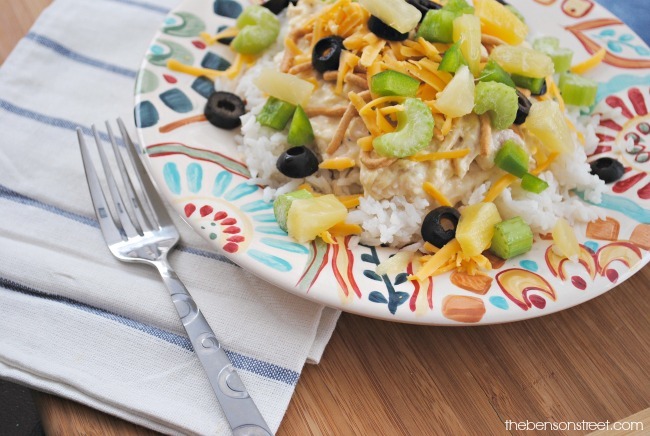 One of my all time favorite meals is Hawaiian Haystacks. I have requested them on birthdays and other special occasions. Now that I cook for my little family, I love making them even more because they are super easy especially when you make them in the slow cooker! These make a great family meal because everyone can pick and choose toppings which might be the best part (wink, wink). Anything you think will taste good, go ahead and pile it on top. What would you add to the list? This rice is served over steamed rice and is a yummy way to get fruit, veggies, protein all in one meal. Plus, the leftovers taste just as good or even better the second day. An easy slow cooker meal. Cook for 4 to 6 hours on high or 6 to 8 hours on low, until done. Combine remaining ingredients except for rice and toppings in the slow cooker. Add shredded chicken and mix. Cook until sauce is heated through, about 30 minutes to an hour. Serve over steamed rice with toppings. Topping ideas: green peppers or red peppers, olives, pineapple, cheese, tomatoes, crunchy asian noodles, celery, almond slivers, peanuts, green onions. Add more water or milk if you like a thinner gravy. This can also be made with cooked shredded or cubed chicken and heated on a stovetop. Sounds so easy and yummy! I need to try this soon.